There has been some discussion recently around FMC scratchpad messages, their role in flight deck alerting, and an appropriate crew response. Most particularly around the habit that some crew develop – usually during transition simulator training when many spurious messages are generated and often cleared without real understanding of their meaning). We areseeing this in the sim and in the aircraft – occaisionally to the detriment of the operation of the aircraft. 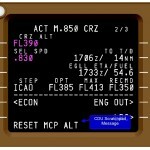 FMC (Flight Management Computer) scratchpad messages are generated at the bottom of the screen built into the FMC CDU (Computer Display Unit). It is a one line display that the FMC uses in order to pass a message onto the crew. They are not (directly) a part of Boeing’s design intent for the alerting system of the aircraft – that said, some of them do come with an EICAS alert FMC MESSAGE – many do not though. The scratchpad itself is the incongruous name given to the bottom line of the CDU. Any text entered in via the keyboard or line selected down from the higher lines of the CDU end up in the scratchpad. From here they can be either cleared or line selected up into one of the lines of the CDU display above. 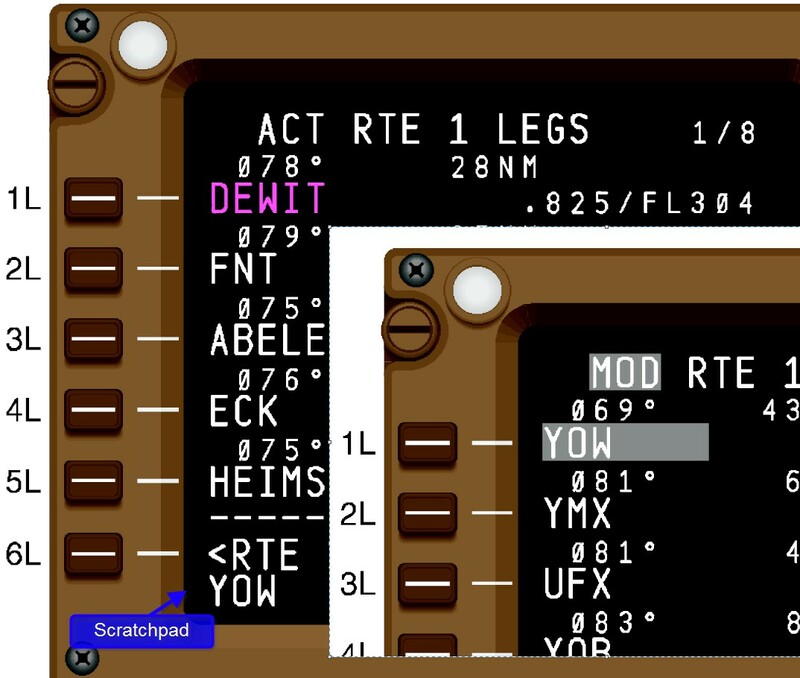 As an example, you can use the keyboard to enter the name of a waypoint “YOW” and enter it into the LEGS page to change aircraft navigation. The scratchpad is also where the FMC places messages. These messages cover many purposes – data entry errors; a requirement for additional information; details of uplink/downlink COM status, and more. Apart from the messages themselves, the FMC CDU also has CDU Annunciator lights on the front used to communicate as well (DSPY – Display; OFST – Offset; MSG – Message; and EXEC – Execute) – do you know (exactly) what they all mean? The most common response to this is to clear the scrathpad message and adjust the track of the aircraft so that it intercepts the active leg. 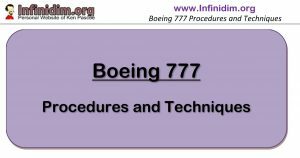 However if instead the message was left in the scratchpad, while you turn the aircraft to intercept the active leg, the FMC would re-evaluate the intercept and remove the message by itself – validating the action of the Pilot Flying. From a CRM/NTS/Error Management point of view – this is a far more satisfying solution. I mentioned that in fact there are two scratchpads – and there are. It is possible to interact with the CDU scratchpad, either entering data via the keypad or line selecting data down from the CDU screen into the scratchpad, while retaining the scratchpad message in memory. Any use of the scratchpad by the pilot will hide the message, but retain it (if it’s not cleared first). Once you have used the scratchpad and cleared it of your entries – the scratchpad message will be displayed. Note that although it may seem clumsy, it’s impossible line select a scratchpad message into a CDU LSK position – but still, it seems like a lot of bother, doesn’t it. Normally the pilot manipulating the FMC will clear this message (hopefully with the acknowledgement of the other pilot) and then ideally deal with the missing speeds straight away. However it is entirely possible to retain this message right through a takeoff speeds entry process until the speeds are re-entered, at which point the message will self clear. Which of these two process is less prone to error – less prone to forgetting to re-enter your speeds? In any event, our discussions did resolve one thing – we are going to introduce an SOP whereby a pilot who intends to clear a scratchpad message is required to confirm that action with the other pilot. For the most part – this should be happening anyway, but taking this action raises the visibility of a good habit – and give Check Captains something to look for as well. Practices & Techniques : The FMC is trying to tell you something – why aren’t you listening? The CDU scratch pad is the FMC’s prime method of trying to tell you something. Messages like “UNABLE HOLD AIRSPACE” or “TAKEOFF SPEEDS DELETED” or “ROUTE DISCONTINUITY” are the FMC’s way of communicating a problem to the crew – a problem that is valid, even if the crew don’t understand the message. It’s not uncommon to see crew clear those messages with minimal acknowledgement, a habit that unfortunately commences during simulator training. CDU Scratchpad messages need to be dealt with like any other annunciation in the flight deck. Noticed, Called, Analysed, Acted Upon. Some of the more common(ly ignored) FMC messages are listed here. VAI SOP Standard Calls require the CM1/CM2/PF/PM to confirm a scratchpad message with the other pilot prior to clearing a message. This requirement commences once the pre-flight initial CM2 setup / CM1 cross check is complete. 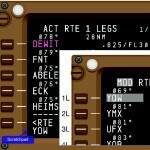 While there are scratchpad messages which are all but inconsequential to flight (STANDBY ONE or INVALID ENTRY) and there are messages which are commonly understood and occur routinely (INSUFFICIENT FUEL [during route changes]; UNABLE HOLD AIRSPACE; DRAG REQUIRED or UNABLE RTA) there are also messages which can have a significant impact of flight path and flight safety (DISCONTIUITY; INSUFFICIENT FUEL; RW/ILS FREQ/CRS ERROR; or TAKEOFF SPEEDS DELETED). Finally, a smart pilot may not choose to clear an FMC CDU Scratchpad Message – but instead retain the message in the scratchpad until the underlying cause has been corrected. The CDU is fully functional while a scratchpad message is displayed with any data entered into the scratchpad line replacing the message until that data is either line selected into the CDU or cleared, at which point the message is returned – if it’s still valid. An example of this could include “NOT ON INTERCEPT HEADING” when LNAV has been armed but the aircraft is not tracking towards an active leg – correcting the aircraft track will clear the scratchpad message. 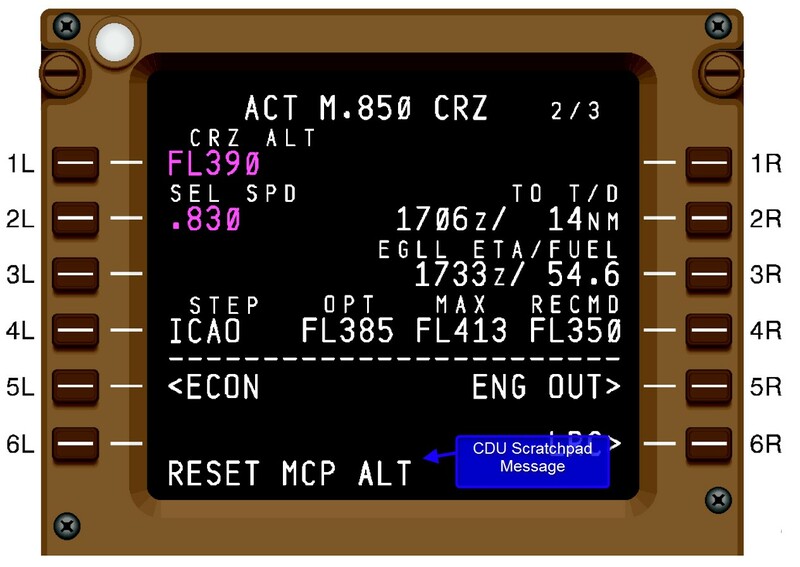 The FMC CDU communicates with pilots through data entered and calculation results on the CDU itself, four CDU Annunciators (DSPY, OFST, MSG and EXEC) and CDU Scratchpad Messages. These messages are categorised into Alerting, Communication, Advisory and Entry Error messages. Anytime a CDU scratchpad message is generated after the initial pre-flight CM1/CM2 data entry/cross check procedure is complete – the CM1/CM2/PM/PF is required to check awareness in the other pilot prior to clearing the message. This is required whether the EICAS FMS MESSAGE is generated or not. For a conservative NTS operation – consideration should be given to not clearing certain scratchpad messages, but instead dealing with the underlying cause behind the messages. Once the cause has been dealt with, the scratchpad message will be removed by the system. D5 Practices and Techniques refers.